While scrolling through Facebook the other day, I saw that Yolanda from Put The Kettle On had posted a survey asking whether or not people go all-out for Valentine’s Day. For my husband and I, heading to our favorite restaurant is about as extravagant as we get. And come to think of it, I can’t remember the last Valentine’s Day we even did that. Needless to say, my contribution to the poll was a “no.” And I don’t think that’s a bad thing. As you may have gathered, I’m a homebody. For me, staying in playing games and watching movies sounds much more appealing than getting dressed up and heading out to a bar or restaurant. Admittedly, these things are fun everyone in a while, but 9 times out of 10, I’d opt to stay home. But here’s the deal; staying home doesn’t have to be boring! 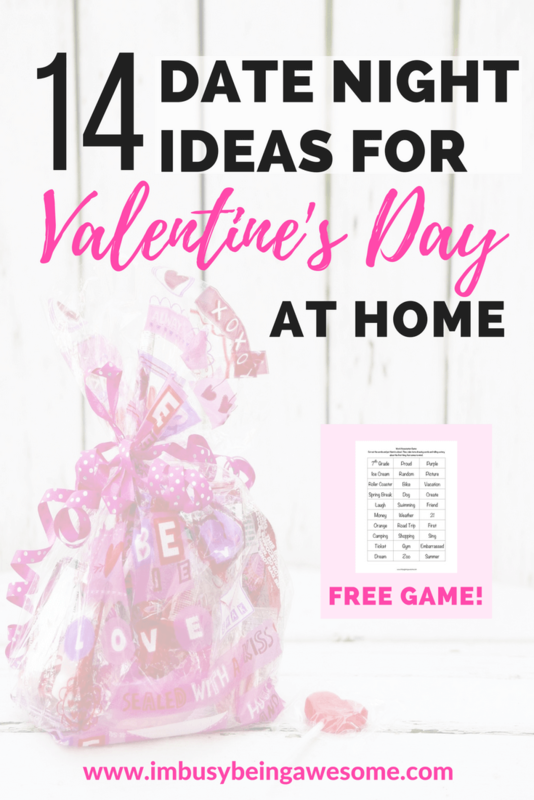 With Valentine’s Day just a week away, and inspired by Yolanda’s poll, I decided to brainstorm some unique, fun, and affordable ideas for date night at home. 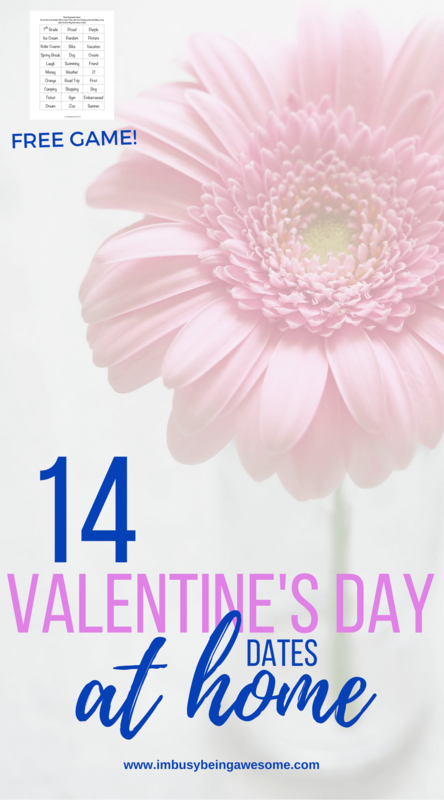 From theme nights, to DIY projects, to virtual double dates, these 14 suggestions might have you choosing to stay home more often, whether it’s Valentine’s Day or not! Select a theme for the evening and plan your entire night around that theme. French night? Cook a French meal (I highly recommend this classic French cookbook!) listen to some Debussy during dinner, and watch a French-inspired movie like Midnight in Paris or Julia and Julia. (If you’re particularly ambitious, try a French film like Amélie or The Rules of the Game (La règle du jeu). Not feeling French night? That’s okay! There are so many other themes you can choose: your favorite decade, vacation spot, Disney movie, television show, holiday (who says you can’t have Christmas in July?) etc. Would you rather is such a simple yet engaging game. It can rouse some great laughs, but it can also spark important conversations. Combine this game with a few other suggestions from the list, and you have a whole night of fun in front of you. If you’re looking for some good “would you rather” questions, Conversation Starters offers a free list of over 200 questions on their site. If you’d prefer something a bit more formal, Amazon offers an array of options based on subject matter, age level etc. My husband and I love dreaming up plans for our future, and we especially enjoy planning leisurely vacations. (Whether we end up taking them or not is another matter; it’s just fun to dream!) Spend time brainstorming locations, hotels, activities, travel dates, etc. Not only is it fun, but you’re also one step closer to taking that dream vacation! While this might seem like an obvious option, it can be a lot of fun when you go all-in and plan everything together. Yep, Everything. This means looking through cookbooks, getting the groceries, and cooking the meal together. It’s a fun twist on the typical dinner at home. Seriously. This is super fun. Whether you battle one another in Wii tennis, spend hours racing around the tracks of Mario Kart, or you go old school and pull out the Super Nintendo (my husband and my gaming console of choice), video game night will fill your evening with fun and laughter. Combine this idea with video games and you’ve completely embraced your inner child. But really, you’ll love this! Grab some blankets, pillows, old favorite movies, board games, snacks etc. Lounge around in your jammies, and hang out playing and talking all night. This idea would be fun to combine with the slumber party, too. Pick a favorite series, a handful of musicals, your favorite Disney movies etc. Pop some popcorn, curl up on the couch, and press play! Trying to save a bit of money but love going out to music? There are so many fantastic recorded live concerts and documentaries available on streaming. My husband watches them quite often, and he got me hooked, too. Even if you just put on a concert in the background while playing games, it makes for a fun and different form of entertainment. Don’t have time to write down a bunch of words? I have you covered. 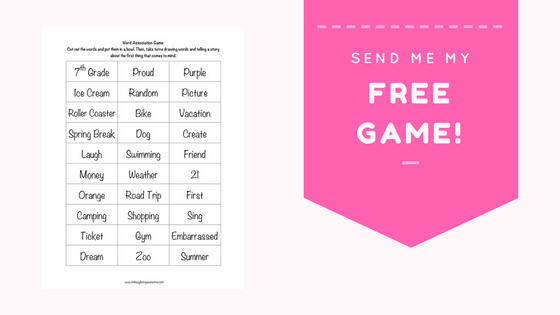 Here is a list of 30 words that you can download and print out tonight! I know, I know. This is a pretty obvious suggestion, but it’s also incredibly fun. Ryan and I often pull out games on the nights he doesn’t have a gig. My personal favorite is Scrabble, and Ryan’s is Yahtzee, so those two are always on rotation. We’re also big fans of Phase 10 and Skip-Bo. Pair game night with the concert idea above, or simply play some of your favorite tunes, and enjoy! Do you have a couple that you haven’t seen in a while? Perhaps they live a few hours away or in another part of the country. No problem! Just pull up FaceTime or Skype and have a virtual date! Team up across the interwebs and play charades, Pictionary, or anything else you can think of. It’s a great way to reconnect with those you haven’t seen in a while. Pick up a few different wines, an array of cheese and fruit, and do your own wine tasting at home. Want to try several different kinds of wine but you worry about breaking the bank? Good news! Many companies are now making smaller sizes with 1.5-3 glasses per bottle. It’s the perfect way to try a variety while also stretching a buck. So the next time you’re having date night at home, give one of these ideas a try. Homebody or not, you’re bound to have a great time! 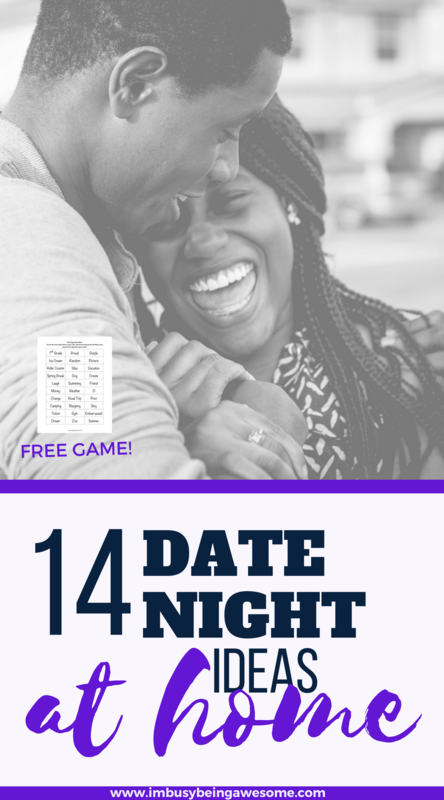 Want to play the word association game on your date night at home? Download a list of 30 words here! Do you prefer staying in or going out? What is your favorite date night activity? 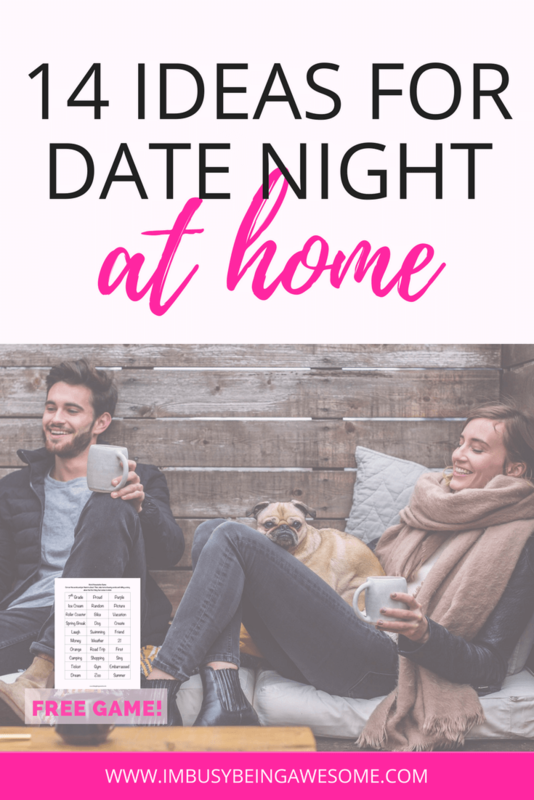 Do you ever do date night at home? Let me know below! I love this post so much (and that’s for the call out Paula)! I hear you too in regards to staying home 🙂 I’m always happy to do that. The theme night sounds amazing and you just happened to pick two of my fave movies – Amelie and Julie and Julia! I also just downloaded the the word association game, which we’re going to do on Valentines night – with the fam! Absolutely; thanks for the inspiration! I love both of those movies, too 🙂 I hope you enjoy the game tonight! 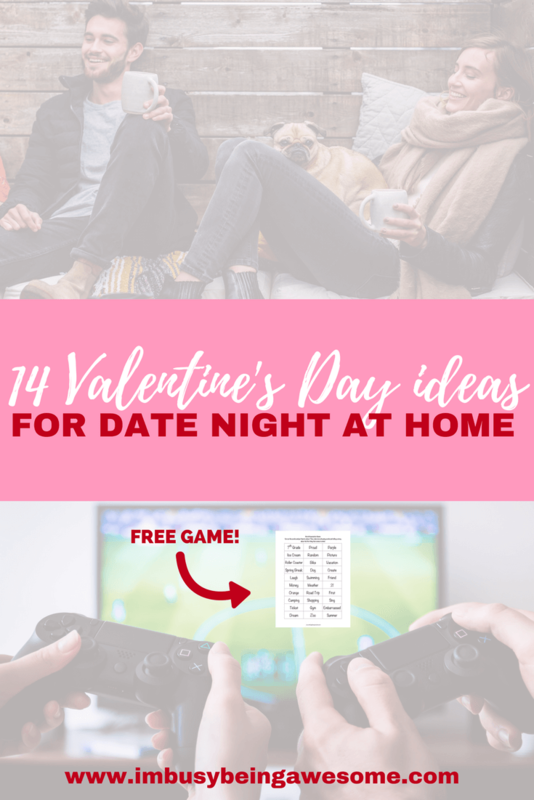 Video games and crafts always make for a fun date night! Thanks for the ideas! These are great! My husband and I love Mario Kart and have several different projects lined up. We also love just picking a movie and chilling out together. Quality time for just the two of us is so important. That’s amazing! I love that play chopped 🙂 So fun. I LOVE the idea of a virtual double date! Some of our best friends live on the other side of the country. We have to try this. Thanks! Yay! Let me know how it goes 🙂 It’s such a great way to connect with those who are far away. 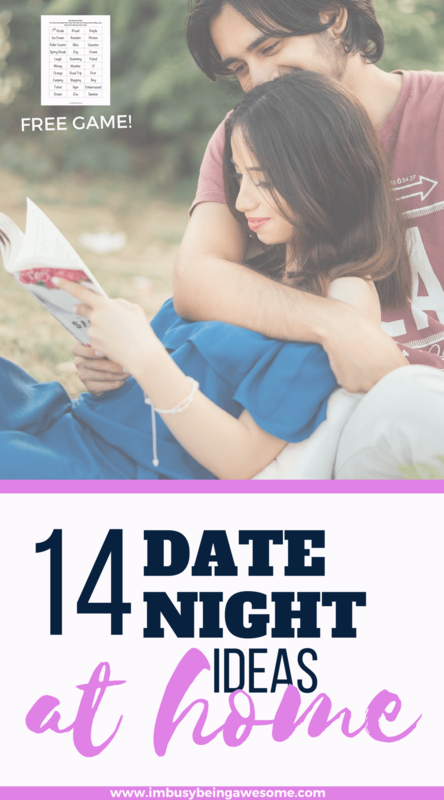 These are fun, I like both at home and going out dates, but with the kids we definitely do more at home date nights. Our Valentines tradition is pizza and a horror movie, maybe not the most romantic, but we always look forward to it. All so fun and most don’t cost a thing! Thanks! The best kind of fun – ha!